The Horse Prairie Ranch (HPR) - one of southwest Montana's oldest working cattle ranches hosts a limited number of guests during the summer months. A stay at the HPR has been described as a ""first-rate adventure in the last best place"". The HPR offers 4 and 6 night stays from June through September. In addition to authentic working ranch chores on a large cattle ranch, which includes cattle drives, trail rides, and pack trips, guests at the HPR can also learn about the rich local history on and around the ranch. Included in that history is Meriwether Lewis' encounter with the young Shoshone Indian on horseback, a trip to Lemhi Pass, and the Nez Perce's flight from the Battle of the Big Hole, just over the Big Hole Divide from the historic Horse Prairie Valley. The HPR also offers on-ranch fishing for Westslope Cutthroat Trout and off-ranch, guided fishing at such Blue Ribbon Rivers as the Beaverhead and Big Hole Rivers. The HPR also offers guided elk hunts in the fall from the only overnight, pack-in permit in the area. Guests stay in private luxurious log cabins, which sleep from 1 to 8 persons. 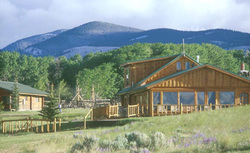 The HPR's reputation is providing a genuine ranch life experience in one of America's last bastions of authentic cattle ranching in very nice, private accommodations. .You will travel through the headquarters of the ranch (large classic red barn) and onto the cabins at Lake Side, which is about 2 miles beyond the ranch headquarters area.